These healthy matcha cookies are such an easy and simple treat! They are keto and gluten free and taste a bit like almond flour shortbread with a green tea kick. This healthy matcha cookies post is sponsored by Vital Proteins, but I only recommend products and services that I have personally tried and believe are of value to my readers. All opinions in this post are my own. 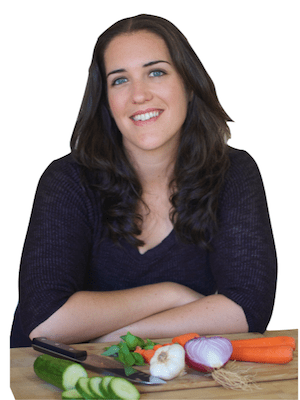 To learn more about the benefits of collagen and gelatin, check out my post 10 Incredible Health Benefits of Gelatin! Even though matcha does contain caffeine, many people say that matcha gives them sustained energy without feeling jittery like with coffee. Considering the huge list of health benefits for both collagen and matcha, it’s no wonder that a product containing both of them would be a huge win! 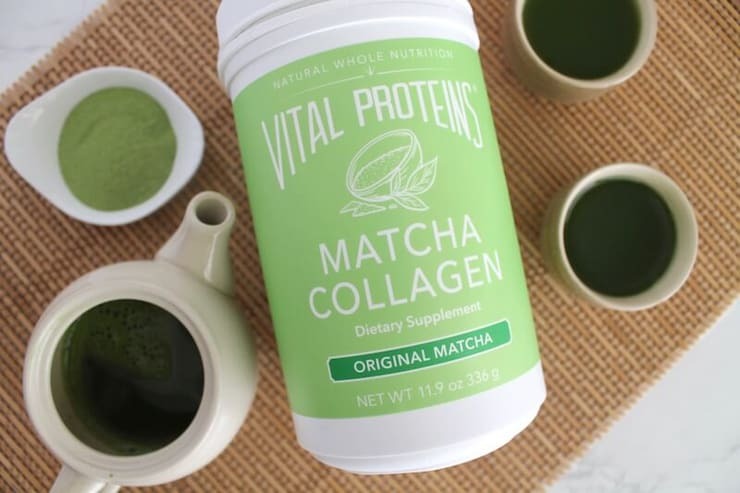 I was so excited when I heard that Vital Proteins introduced a matcha and collagen blend. I’m already a huge fan of vital proteins collagen peptides and love they they source it from responsibly raised grass fed bovine. I use it all the time in my smoothies and recipes like these chocolate chip no bake energy balls. Vital Proteins Matcha Collagen is bioavailable which means that it’s easy for the body to digest and absorb. The high quality Japanese matcha in this blend contains about 137 times the amount of free-radical fighting antioxidants than other green teas. You can add Vital Proteins Matcha Collagen to hot or cold water and drink it like tea. You can also make matcha smoothies, matcha yogurt, or these matcha cookies! The possibilities are endless! This matcha cookie recipe has only about six main ingredients that are pretty simple to throw together including almond flour, coconut flour, Vital Proteins Matcha Collagen, cashews and butter (read here why grass fed butter is healthy). Since there are no eggs in these matcha cookies and the butter and gluten free flours take the main stage, the cookies take on a rich, crispy and buttery shortbread flavor and texture along with an earthy vanilla flavor from the matcha. 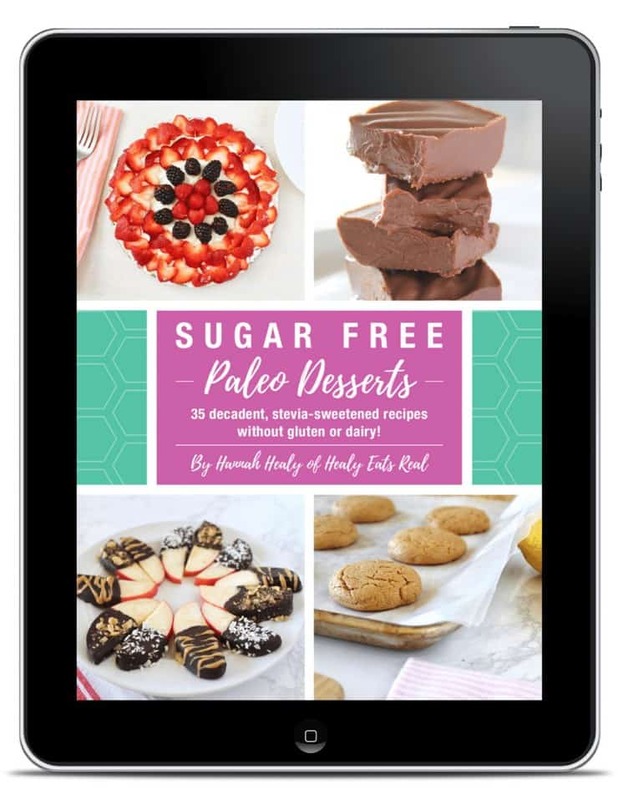 These cookies only have 1.6 net carbs per cookie (when using monk fruit sweetener or swerve), making them a great occasional treat for those following a low carb or keto diet. So far I’ve only made this recipe with the Vital Proteins Matcha Collagen mixture of collagen protein and matcha, so I don’t know what the right ratios would be or how it would turn out substituted with regular matcha powder. If you experiment, please let us know how it turns out in the comments. Butter is a big part of these matcha cookies and helps to give them their distinct texture. I tested this recipe with coconut oil in place of butter so that there could be a vegan version, but unfortunately it didn’t come out very well, so I would not recommend substituting the butter. However, I have a feeling that palm shortening just possibly might work in place of butter, but I’m not 100% sure. If you decide to test it, please let us know how it turns out in the comments. Make sure to use softened room temperature butter (not melted) and whip the butter with an electric beater to achieve the right texture. Don’t forget to sift the flours before mixing them in. This will improve the texture of the cookies. I added chopped cashews to these matcha cookies to add a crunch and I enjoyed it. You could also omit the added nuts or use blanched chopped almonds or even white chocolate chips (if you don’t mind the added sugar or carbs). Let the cookies cool for about 15 minutes before trying to move them. The need to crisp up and set before being moved otherwise they may crumble. Nutrition facts are available at the bottom of the recipe. The values listed below are using monk fruit sweetener and cashews. If you use coconut sugar instead of monk fruit sweetener it will raise the carb and sugar level. Any other changes to the recipe will change the nutrition facts. Pre-heat the oven to 350°. Put softened (room temperature) butter into a mixing bowl and whip with a hand mixer. Add the granulated sweetener to the butter and whip together with the hand mixer. Sift the almond flour and coconut flour and add to the bowl along with the matcha collagen and salt. Mix together. The consistency will be a thick cookie dough. Add the optional chopped cashews. Form small bits of the cookie dough into cookie shapes and place on a baking sheet lined with parchment paper until all of the dough is gone. Bake at 350° for 8-11 minutes until the sides of the cookies start to turn golden brown. Did you like Healthy Matcha Cookies (Keto, Paleo & Sugar Free)? Don’t forget to rate the recipe and leave me a comment below. You can also follow me on Facebook, Instagram, Pinterest! Pre-heat the oven to 350°. Put the softened butter (should be room temperature, not melted) in a bowl and whip with a hand mixer. Add the monk fruit sweetener or coconut sugar to the butter and whip together with the hand mixer. Sift the almond flour and coconut flour. Add the almond flour, coconut flour, matcha collagen and salt and mix with the hand mixer until fully blended together. Chop cashews into pieces and fold them into the dough. Form bits of the dough into small cookies and place on a baking sheet lined with parchment paper. Bake at 350° for about 8-11 minutes or until the bottom edges start to turn golden brown. IMPORTANT: Be sure to let the cookies cool on the existing baking sheet after removing them from the oven for at least 15-20 minutes or more before you try to move the cookies. They need to settle after baking to harden and crisp up. If you try to move them directly after baking they will crumble. So far I've only made this recipe with the Vital Proteins Matcha Collagen mixture of collagen protein and matcha, so I don't know what the right ratios would be or how it would turn out substituted with regular matcha powder. If you experiment, please let us know how it turns out in the comments. Butter is a big part of these matcha cookies and helps to give them their distinct texture. I tested this recipe with coconut oil in place of butter so that there could be a vegan version, but unfortunately it didn't come out very well, so I would not recommend substituting the butter. However, I have a feeling that palm shortening just possibly might work in place of butter, but I'm not 100% sure. If you decide to test it, please let us know how it turns out in the comments. Don't forget to sift the flours before mixing them in. This will improve the texture of the cookies. I added chopped cashews to these matcha cookies to add a crunch and I enjoyed it. You could also omit the added nuts or use blanched chopped almonds or even white chocolate chips (if you don't mind the added sugar or carbs). Love all the healthy benefits in these yummy cookies! Me too! So nice to have a dessert with nutrients in them as well. These look so delicious. I’ve never has matcha cookies before, I’ll have to try them out. They are such a fun treat! I have matcha tea, and I have Vital Proteins Collagen. Any ideas on how to combine them to get the same flavors as the Matcha-Collagen protein for this recipe? Hmm, I’m not totally sure, but maybe combine half and half? 2 scoops of VP matcha collagen is about 3 tbsp. I love Vital Proteins…I didn’t realize they made a matcha flavor. I bet it is great in this cookie recipe. Woo hoo! So glad to find a healthy recipe! And I’ve been wanting to try using monk fruit so now there’s no excuse not to. I really love matcha and try to have it as much as possible. Great recipe! Thanks! Yea, I’m new to monk fruit sweetener, but am loving it! This is an exciting recipe. Love the keto paleo everything and the great use of matcha. Very interesting products. These cookies look so tasty! I’ve not tried any products from Vital Proteins before and might have to give them a go. Such a healthy snack with the benefits of matcha green tea. I definitely need to try out this recipe. I tried this recipe today and I liked the taste. However, it could not stay together and crumble a lot, almost Powderly. I followed the direction. What else could I do to make it more harder? Did you use the exact same ingredients, including the vital proteins brand of matcha collagen? If you just used matcha in place of that it would not hold together well. The collagen adds bulk to keep it together. I just discovered your site. This recipe is something I have been looking for, a matcha dessert that is paleo! Would it work to use a different bone broth protein powder or plain plant based protein powder and add matcha powder? If so, do I just substitute protein powder by weight or volume? How much matcha powder would I use? I already have these. Thanks! I’m not sure. I’ve only made it with vital proteins matcha, so your guess is as good as mine! Let me know how it turns out if you do experiment! Do I need to add an egg if I’m subbing the vital proteins powder for pure matcha powder? Also, can I do just almond flour? I haven’t tried those substitutions so I’m not sure if it will turn out with those changes. Let me know how it turns out if you do experiment!